Get groovy! 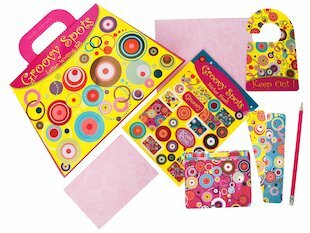 Full of treats for letter-writing moments, this pretty polka-dot stationery will leave you wide-eyed. With delicious dots and colourful circles studding and spangling everything in here, you’ll turn heads and open eyes with every letter you write! This beautiful carry folder comes with 10 sheets of writing paper, 10 envelopes, 10 postcards, 2 bookmarks, a door hanger, a sticker sheet and a pencil. Just before I write how GREAT this is, I jus want to add on that this is not a book, this is a writing set and is absolutely BRILLIANT! The colours are cool and its all you need if you want to write a fancy letter! So if you need a writing set… THIS IS 4 YOU!